Typically, as yields rise, so too do bank stocks. It may seem surprising (at least it was to me) that the 10-year yield has fallen in the days following the last three Fed hikes. As a result, bank stocks like Bank of America have corrected in lock step. 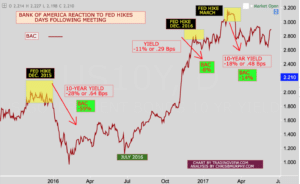 If you recall, the value of the 10-year yield is driven by inflation and growth expectations and not necessarily by Fed hikes. As a result, the 10-year yield has fallen over 14% since the March rate hike as waning optimism over economic growth and the President’s business-friendly agenda getting passed through Congress. Global capital flows into the U.S. are driving down yields and somewhat offsetting the Fed hikes or at least, offsetting the Fed’s plans for steepening the yield curve in their effort to get banks to lend more money and normalize the Fed’s interest rate policy. For the complete analysis, please click on the articles images or links. Bank of America stock has fallen or corrected by a minimum of 8% in the days following the last three Fed hikes. 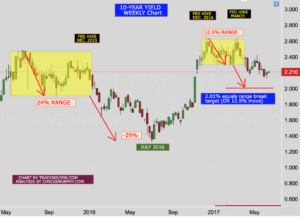 The 10-year yield has corrected on lower growth expectations and is currently in a 12% bearish move. The charts show that 2% should be the bottom for yields. 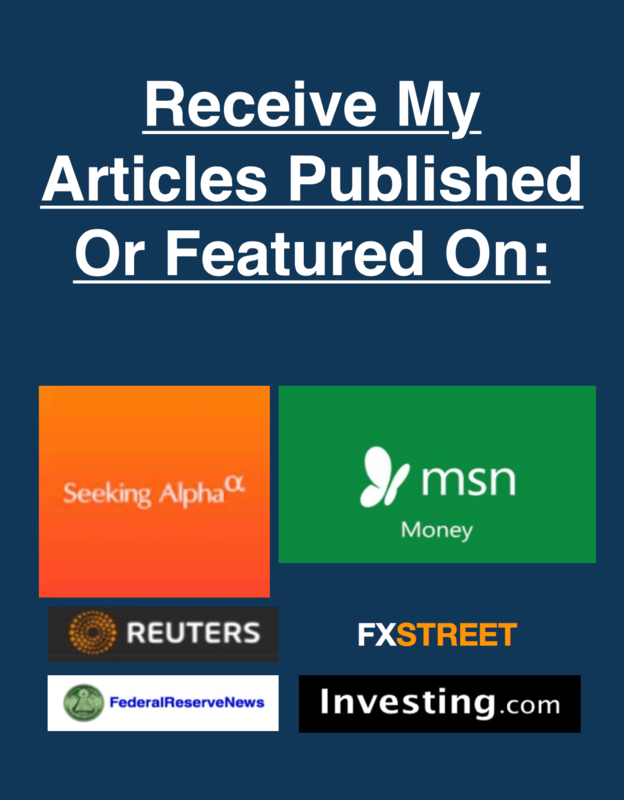 For EMAIL ALERTS on Bank of America & Fed actions as they happen with analysis of how bank stocks are impacted, please fill out the form below. Articles emailed in the morning once published to investment sites. Includes Fed updates and impact on banks. We will never share your email with anyone.